Carl von Clausewitz: ON WAR. A Note About the Translator, COL J.J. Graham. Colonel J.J. (James John) Graham (1808-83) was the first writer to produce a full English translation of Carl von Clausewitz's military-philosophical classic, On War (London: N. Trübner, 1873) [originally Vom Kriege (Berlin: Dümmlers Verlag, 1832)] Graham himself is an elusive character, surprisingly so. His father, his son, and at least one of his grandsons were generals, but J.J. himself was put on half-pay in 1842 and never returned to active service in the British army. He entered Sandhurst in 1822, served in the West Indies as deputy judge-advocate, and evidently served briefly as an engineer. 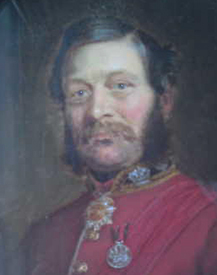 From 1832 to 1835 he took civilian employment as secretary and treasurer to the South-Eastern Railway Company in England and then returned to the army as a captain in the Seventieth (Surrey) Regiment of Foot. He was involved in a colonization scheme in Canada in 1851, apparently aimed at settling British veterans there. In June 1854 he was promoted to lieutenant-colonel on the unattached list (i.e., he was not attached to any British regiment) and then served as military secretary to Sir Robert Hussey Vivian, commander of the British "Turkish Contingent" in the Crimean War. For the latter service he was awarded the Turkish Medal and also the Sultan's Order of the Medjidie, Third Class. He sold his commission in 1858. Graham's book Elementary History of the Progress of the Art of War (1858) is a rather sophisticated work. Perhaps it was too sophisticated, particularly for the distinctly anti-intellectual tastes of the British army in this period. His other major work, Military Ends and Moral Means (1864), is a classic statement of the reformist critique of the British army. Its title amply conveys his concern with moral factors in war, and his organizational proposals are much like those of John Mitchell. By this time, however, such views were becoming widespread. In reading Graham's earlier work, one is tempted to see a Clausewitzian influence, but this is a hazardous approach to be avoided as a matter of policy unless there is a proven prior connection. Neither of his two substantive books mentions Clausewitz explicitly. Graham cited Jomini several times with approval but was by no means dogmatically attached to his teachings. Like most British military writers, Graham was decidedly eclectic. The specific reasons why Graham undertook to publish a translation of Vom Kriege in 1873 are unknown. There is no contemporary evidence--other than its timing, which may well be coincidental--that the translation of Vom Kriege was motivated by German military successes or by Moltke's praise of Clausewitz. There is no internal evidence that the events of 1870/71 were the motivating factor or any evidence of an interest in Moltke; in fact, neither Graham nor the contemporary reviewers even mentioned Moltke. The assumption of a link between Moltke's influence and the translation of Clausewitz derives from F.N. Maude's frequent discussion of Moltke in his introduction and notes to the 1908 edition. Graham may have begun his work much earlier. It is in fact conceivable (although it cannot be demonstrated) that Graham was the author of the 1835 review of On War. There are similarities in style; Graham was in England at the time; and he held the same social views as those expressed by the anonymous reviewer. Further, even though Graham's 1873 work certainly had long-term importance, sales of the book were minuscule. There is thus no reason to conclude that the timing of this publication represented any great upsurge in British interest in Clausewitz's ideas. From a business point of view, the publication of On War was a failure. Only 254 copies were printed in 1873. Of these, 21 went to Graham and 32 were sent out as free review copies. Of the rest, 192 were still languishing in the publisher's hands in 1877. For some unknown reason, Trübner printed a further 440 copies in that year, and 572 were still in the warehouse in 1885. The book drew no substantial audience and Graham's material rewards thus appear to have been few. He was appointed a Military Knight of Windsor in 1877, but this was not much of an honor and was unrelated to his publishing ventures. The name "Military Knights" was a new term for an ancient order that had been called the "Poor Knights" until around 1833. Not actually a knighthood, membership was granted as a form of relief for indigent retired officers. Graham evidently lived the rest of his life in quarters provided at Windsor. He died there in 1883. Whether Graham's work was a success as a translation is worthy of more debate. Peter Paret has frequently criticized Graham's work, and his dismissive views appear to have been widely accepted. In his "Bibliographical Survey" (1965), Paret wrote that "the many inaccuracies of the Graham-Maude translation have often been noted," referring to the 1908 reissue of Graham's work "edited" by F.N. Maude. He cited as evidence a 1908 review in the Journal of the Royal United Service Institution. That review, however, made reference only to some typographical errors in the original 1873 edition, and complained mildly that Graham had adhered too closely to the German phrasing. The criticisms were of Maude's claims to have edited the work when in fact the text was identical to Graham's. The only other complaint was about the expense of the new edition given its "great importance to the Army." There were very few criticisms made of Graham's work before the 1960s, and Paret cannot be regarded as an entirely impartial commentator, since he was already at work on a new translation. By 1976 Graham's translation of Vom Kriege into Victorian English had clearly outlived its usefulness, and the highly readable translation of On War published by Paret and Michael Howard in that year was a great achievement. In saying that, however, it is not necessary to denigrate the Graham version. Although it certainly contains some obscurities and errors, Graham's edition is superior to the most recent translation in at least one regard: It has a useful index. (This is no small advantage, so we offer a Word Index to the newer version). At some points it also more accurately reflects the sometimes lurid language of the German original. Graham took none of the liberties with Clausewitz's ideas that T. Miller Maguire did in his 1909 translation, nor did he add the kind of inflammatory and present-oriented commentary Maude did in his version of Graham's work. [Maude's introduction is here.] Graham's adherence to the German sentence structure may not make for easy reading, but it was evidently rooted in the somewhat self-effacing personality that also led him to avoid any intrusive commentary or insertion of his own views into Clausewitz's work. Paret has correctly noted elsewhere that a translation is inevitably an interpretation as well, but his consciousnes of this truth may have led him to color the work with too much of his own cool intellectualism. As Michael Howard put it, in clarifying the German text, "We may occasionally have overdone it, like overcleaning a picture." The most reasonable criticisms of the Graham translation are not so much of the translation itself as of the third German edition from which Graham worked, which had been corrupted to some degree by its German editors. This criticism applies as well to all of the other English translations made before 1976. Graham's work also included as an appendix Clausewitz's "Instruction for the Crown Prince," which is absent from the newer translations. Although this is sometimes denigrated as being mere instructions for a child, it is useful to remember that the child was the 16-year-old heir apparent of the Hohenzollern dynasty, the future King Friedrich Wilhelm IV (b.1795, r.1840-1861). That family demanded a high degree of military professionalism from its sons, as well it might, since the fortunes of Prussia were uniquely dependent on the military talents of its ruling house. Unfortunately, while the "Instruction" is a valuable document in that it provides clues to the evolution of Clausewitz's ideas, it has more often served as a source of confusion for readers who believe it to be an accurate summary of the larger and later work, Vom Kriege, which it is not. Despite competition, the Graham translation would remain the standard English version for over a century. Roger Ashley Leonard's 1967 A Short Guide to Clausewitz on War was based on it, as was Anatol Rapoport's hostile (and seriously misleading) 1968 abridged edition of On War (Penguin). Graham's was an achievement that merits some respect. In any case, the Graham translation is also a historical document in its own right. Historians should not make the mistake of citing more recent translations when discussing figures whose understanding of Clausewitz would have come from Graham.